4521 ⊙ 42b 70 Kr. 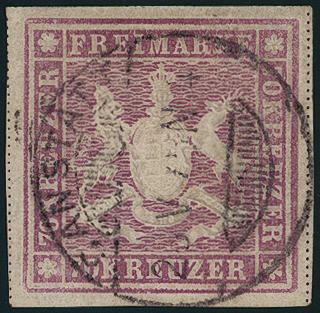 Red lilac, wonderful fresh colors and large margins all around with centered stamp \"CANNSTATT\". An especially nice outstanding quality this Old Germany rarity for the highest standards! Photo expertize Irtenkauf BPP. 4522 123PU 2 ½ Pfg. Gray turquoise, issue 1916, unperforated horizontal strip of three from lower margin with house order number ?4120.16? And handwritten registration number from the Empire printing office, large margins all around, wonderful fresh colors and in perfect condition mint never hinged it is only an original sheet from 40 piece from this known, which from the collection of samples the Empire printing office comes and complete auctioned was. This is the only known strip with house order number. 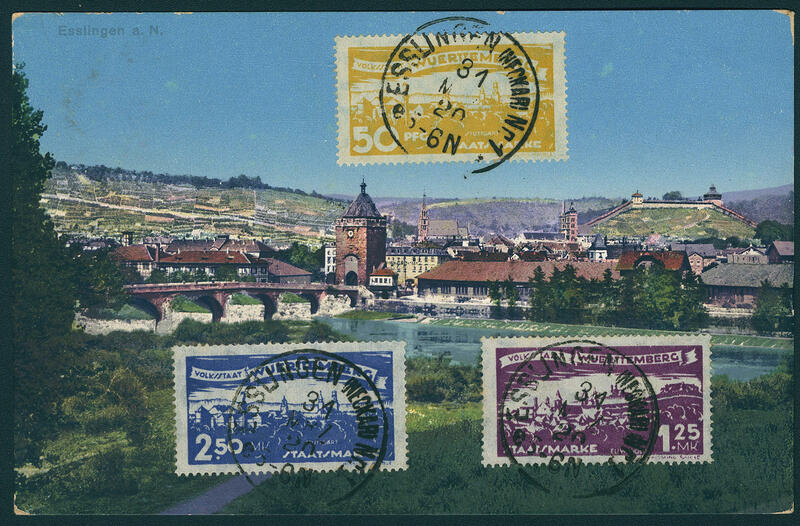 A spectacular unique of the Wuerttemberg philately! Photo expertize \"the stamps are in every respect deficiency free condition\" Winkler BPP. 4523 ⊙ 188 50 on 25 Pfg. Red orange, fresh colors and in perfect condition on self-formed pages, expertized Klinkhammer BPP. Michel 1100,- €. 4524 ⊙ 211 50 Pfg. 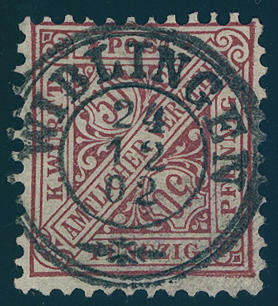 Bright brown red, wonderful fresh colors and in perfect condition with all perfect centric and straight mounted adornment three circle cancel \"WAIBLINGEN 24.12.02. \". The most beautiful us known copy this Wuerttemberg rarity. A piece of dream for your highest requirements! Photo expertize \"perfect\" Winkler BPP. 4525 ⊙ 211 50 Pfg. 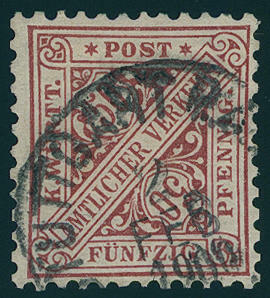 Red-brown, fresh colors and in perfect condition, clean commercially used \"STUTTGART 2. February 1900\". An extremely fine copy this nearly always missing Wuerttemberg rarity! Photo expertize \"the condition is excellent\" Klinkhammer BPP. 4527 ∆ 264d 20 Pfg. Medium violet ultramarine, fresh colors, a few perforation a little shortened, on decorative letter piece with special cancellation \"STUTTGART Constitution Day 25. SEPTEMBER 1919\", used in the correct time before the stamps were demonetized. 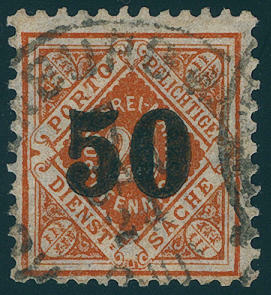 There are very few genuine used examples of this rare colour have become known. Photo expertize Winkler BPP. 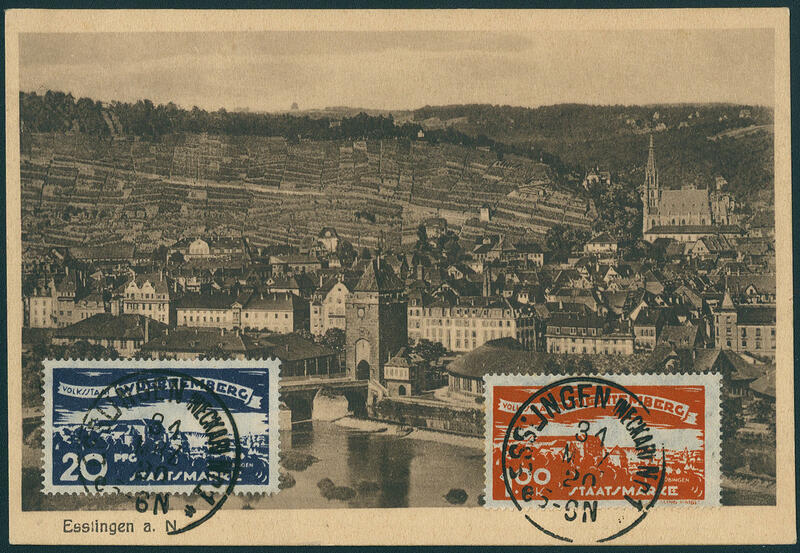 4528 ✉ 272/81 City views 1920, all 10 values on face on four decorative picture postcards from Esslingen, clean and on self-formed pages \"ESSLINGEN 31. November 20. \" from last day. 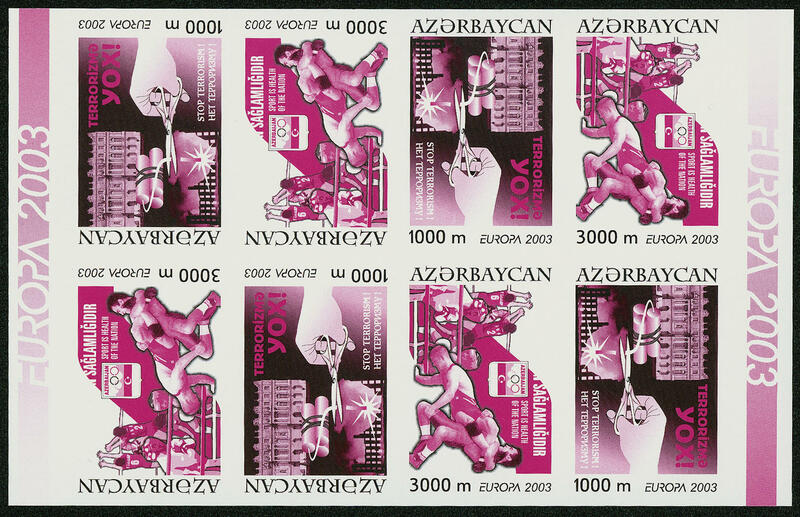 An especially attractive and scarce set. In this kind an eye-catcher for the sophisticated collection! Expertized Infla / Berlin. Aden / Kathiri State In Hadhram.\Aden/kathiri State In Hadhram. 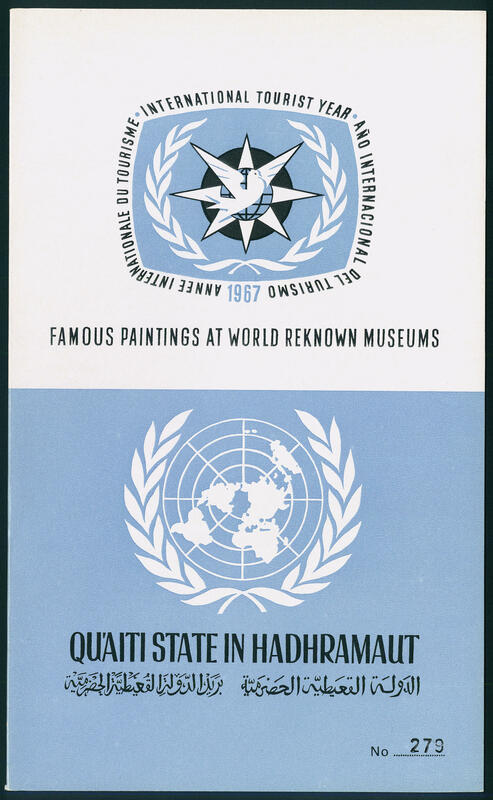 3500 169/76A Famous paintings 1967, all eight values in blocks of four as stamp booklet panes (always two blocks of four se-tenant) in the complete stamp booklet, in perfect condition mint never hinged very small edition! 3502 ✉ 1a 5 C. Pale red, wonderful fresh colors and large margins all around with manuscript cancellation on beautiful cover with complete content, written in \"MENDOZA 4. 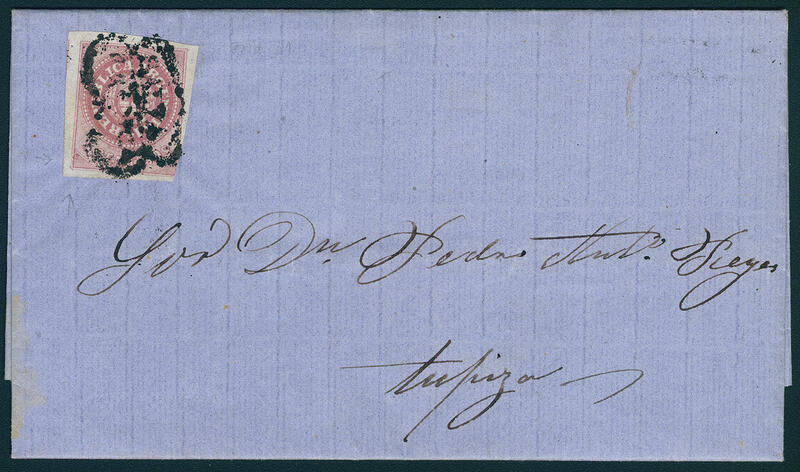 February 1860\" to San Juan. Outstanding quality! Photo expertize BPA. 3503 ✉ 5II/I 5 C. Rose without accent, old plate, wonderful fresh colors and large margins all around, at the bottom on the right touched, on very nice cover with attractive ornamented cancel, written in \"YALTA 12. 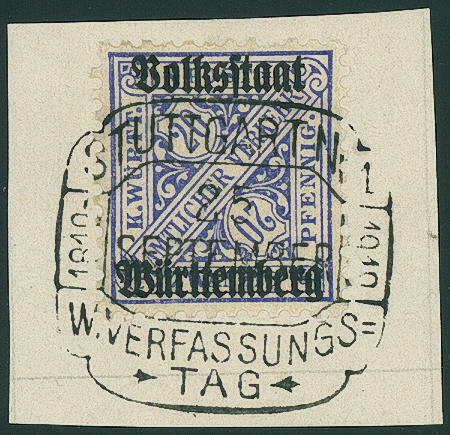 November 1862\" with complete content. 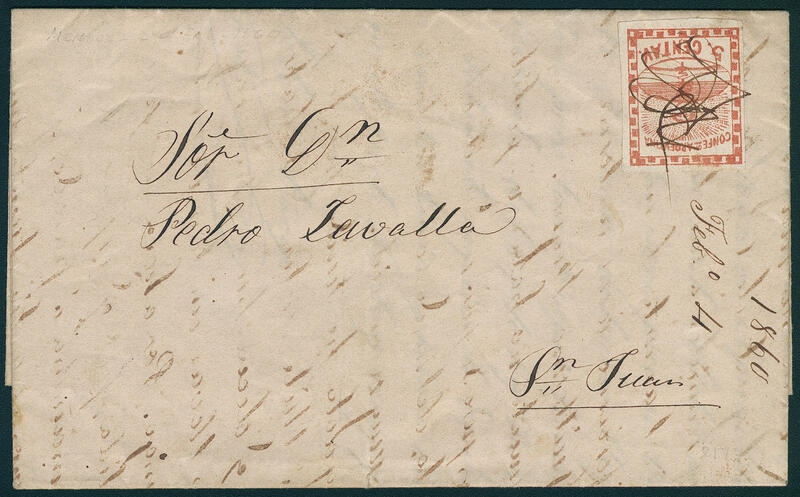 3504 ✉ 20I,Fr.51 5 C. Brick red, crossed ground, fresh colors and in perfect condition in rare double postage with France 25 C. Ceres in the horizontal strip of four on cover with two ring cancel \"buenos AIRES\" with additional red consulate cancel \"Buenos Ayres PAV. FR. J NO. 6 26. 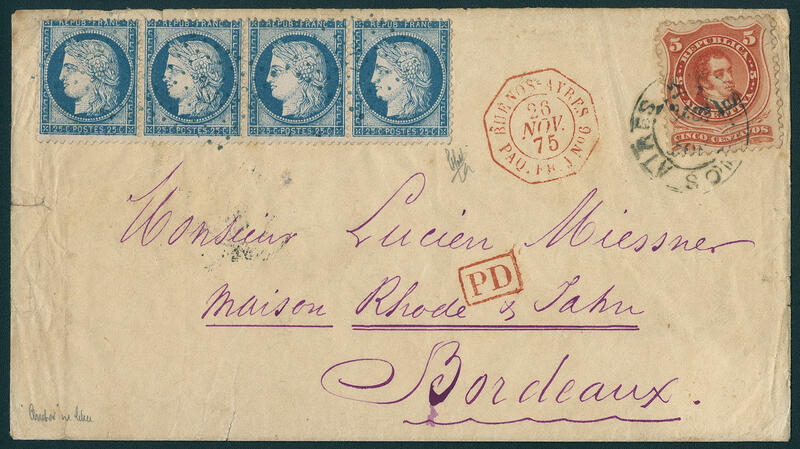 November 1875\", the French franking with arrival postmark with points cancelled. The Argentinian franking paid the domestic postage, against what the French franking for the foreign postage to Bordeaux was used. A decorative and in this kind extraordinary franking combination! Photo expertize Peter Holcombe. 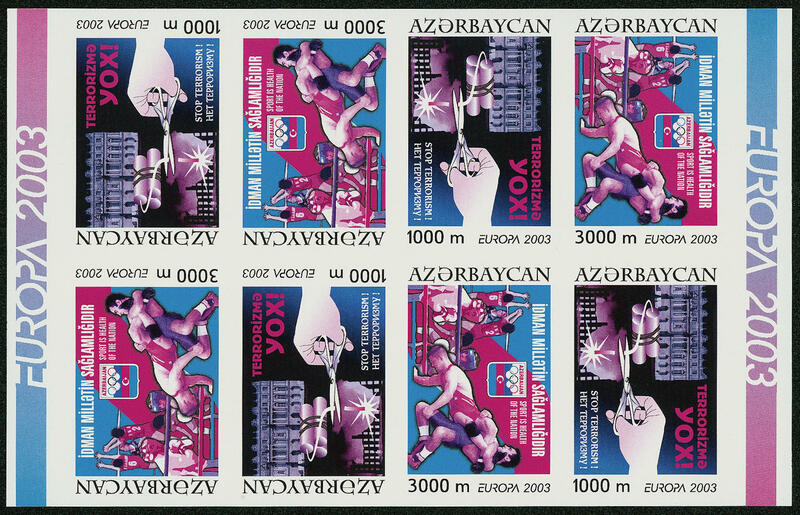 3505 543/44PU Europe 2003, six various phase print trial proofs as blocks of eight, tete-beche shaped arranged, in mixed colours, unperforated, in perfect condition mint never hinged an extremely rare set! 3506 ✉ 15,17II,18 1 / 2 A., 2 A. And 3 A. 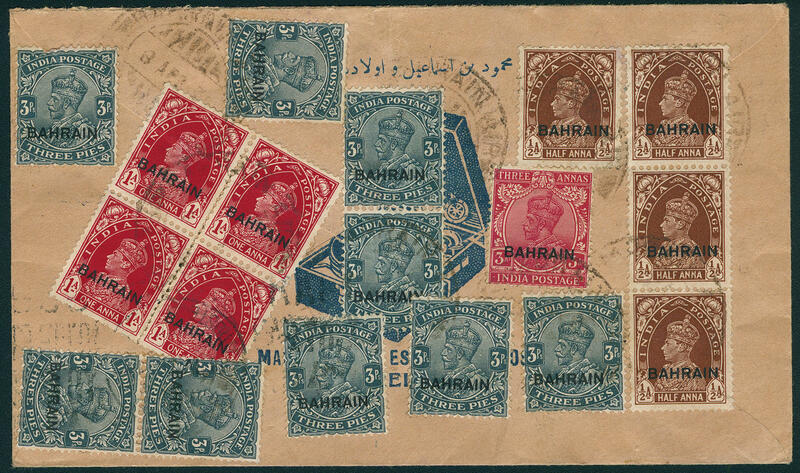 As wonderful having bright colors three colours franking on very nice cover from \"Bahrain 21. AP. 38. 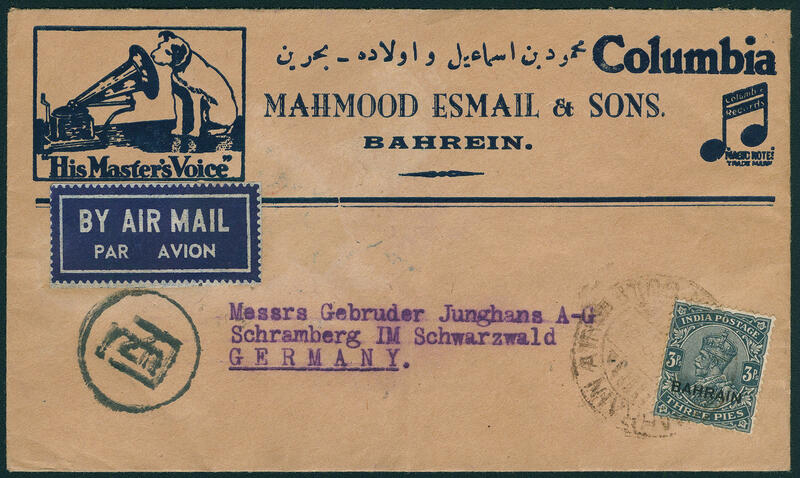 \" with additional violet one-line cancel \"OVERLAND MAIL\" to Schramberg with on the back transit stamp \"BASARA 27. April 38. \" respectively \"BAGHDAD 28. April 38. \". Very decorative and rare! 3507 ✉ 15,18 1 / 2 A. Block of four and as single, as well 3 A. In the pair and single on air mail letter from \"Bahrain 7. OCT. 36. \" to Schramberg / Germany with transit cancellation from Alexandria / Egypt. Rare! 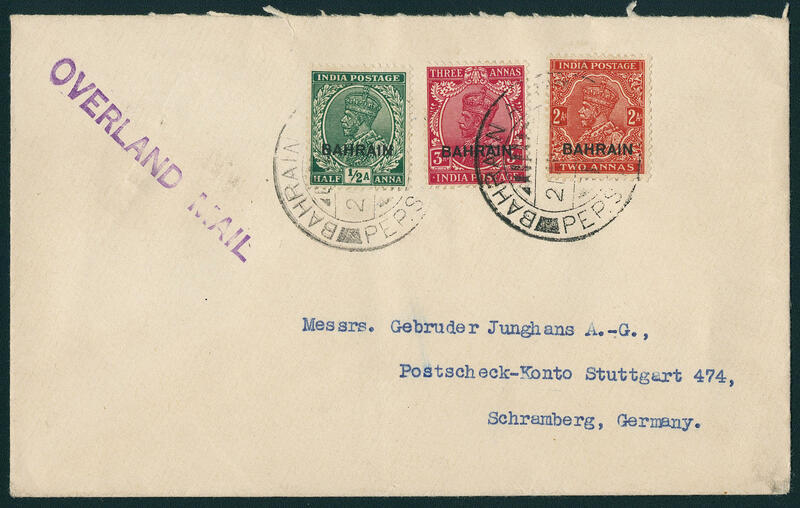 3508 ✉ 18,20/21,23 King George V. And King George VI, decorative mixed franking on very fine illustrated company advertising letter by airmail with 19 values front- and reverse from \"Bahrain\" to Schramberg / Germany. Rare! 3509 ✉ 119,125 15 Fr. 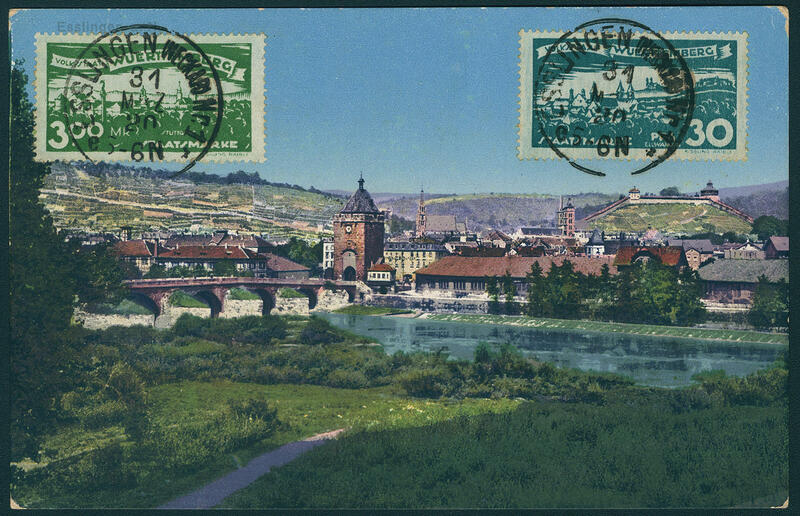 Airmail 1930 and 2 Fr. On 1, 60 Fr. 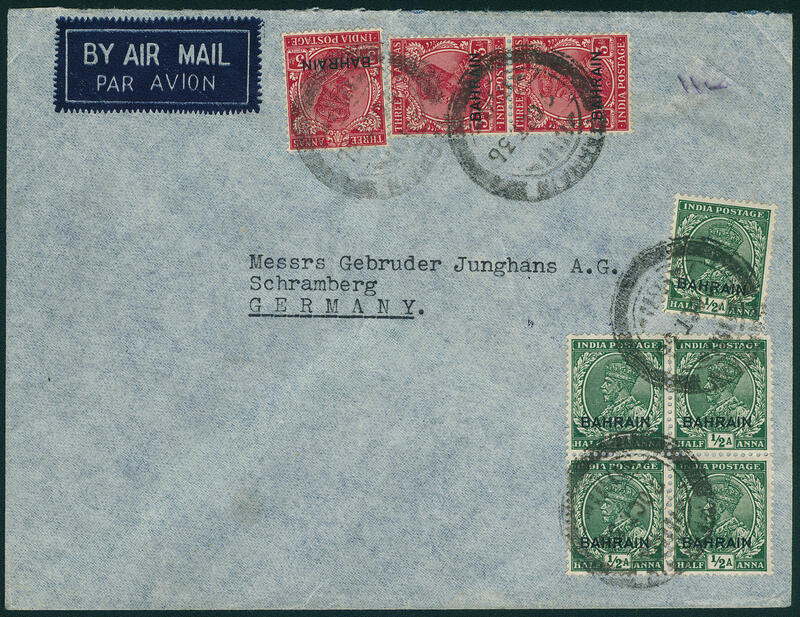 Postal stamps 1931 on extraordinarily decorative and extremely scarce Zeppelin cover to the 10. North America flight 1936 by registered post from \"THYSVILLE 2.9.36. \" as Supply with additional two ring cancel \"flight- and Air ship harbor FRANKFURT 26.9.36. 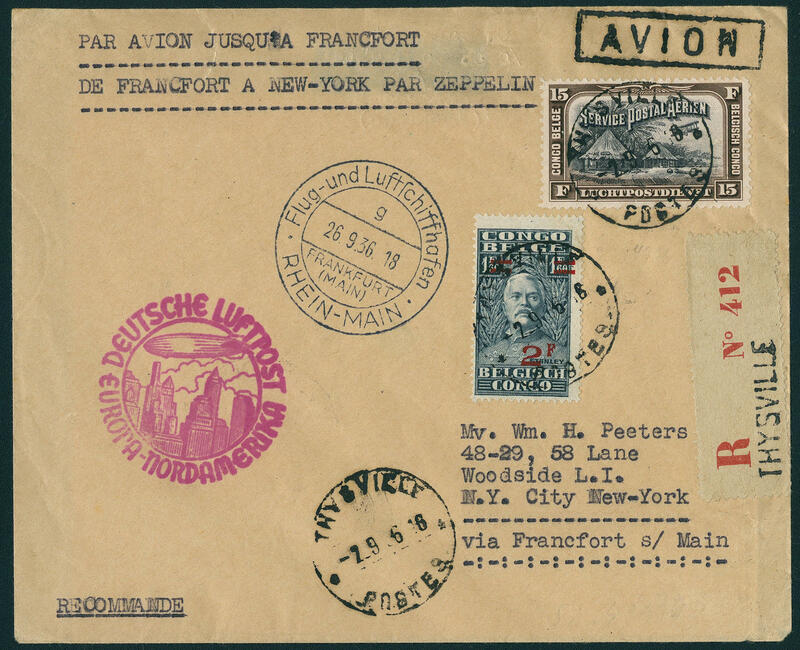 \" and red special confirmation stamp \"German airmail Europe North America\", as well on the back corresponding transit and arrival postmarks, to New York transported. Zeppelin covers with frankings from Belgian-Congo are extraordinarily rare! 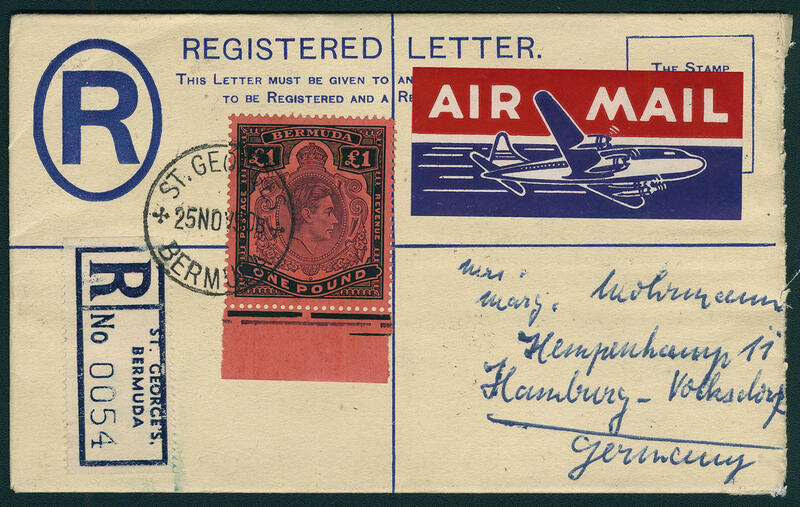 3510 ✉ 116b 1 pound King George VI, black / brown purple on salmon-colored, lower margin copy, fresh colors and in perfect condition as additional franking on registered postal stationery 3 P. Blue with single circle postmark \"ST. GEORGES bermuda 25. 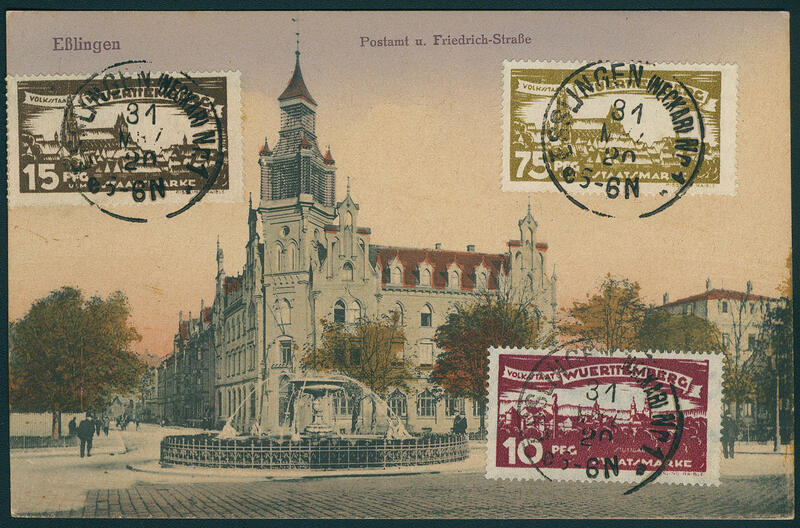 November 50\" to Hamburg-Volksdorf with arrival postmark. Very decorative and rare! 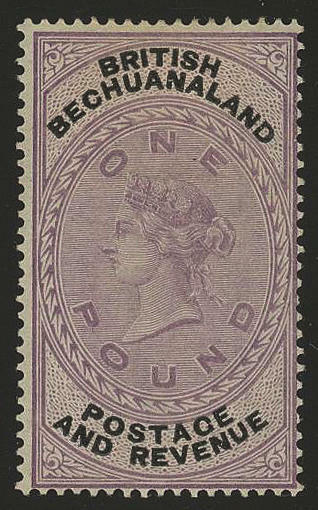 3511 20 1 pound lilac / black, Queen Victoria 1887, wonderful fresh colors and very well perforated, in perfect condition unused. An exception copy of this rare issue! (SG no. 20). Michel 1200,- €. 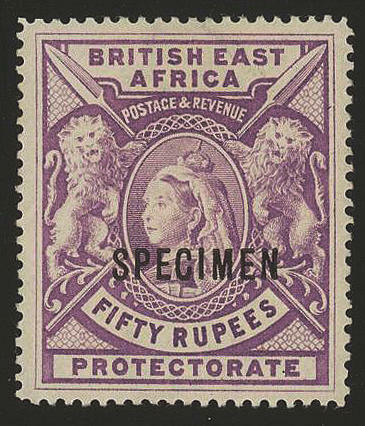 3513 88SP 50 R. Lilac, Queen Victoria 1897, the scarce key value with overprint \"SPECIMEN\", fresh colors and in perfect condition unused. Michel for normal stamp 2700,- €. 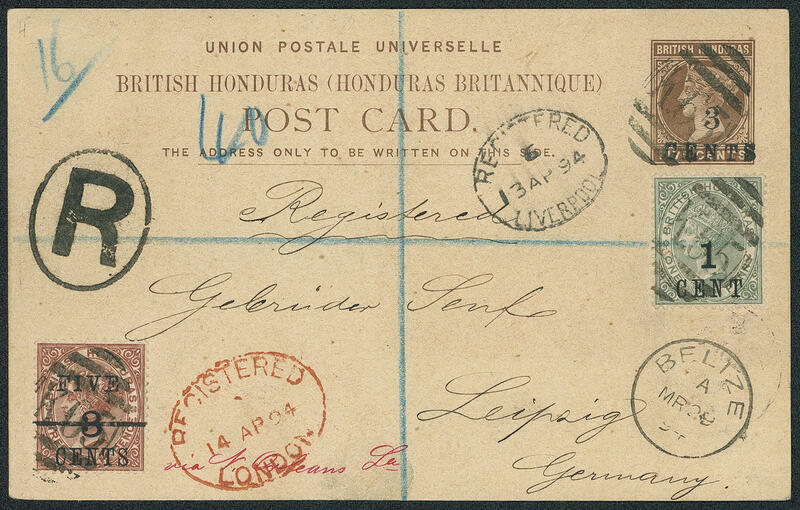 3512 ✉ 16,28 5 C. (issue 1888) and 1 C. (issue 1891) as additional franking on postal stationery 3 C. By registered post with number postmark \"K65\" and additional single circle postmark \"BELIZE\" with registered transit stamp from liverpool and London, to Leipzig with arrival postmark on the back. Very decorative and rare!